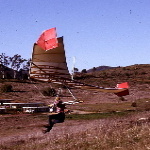 US Hawks Hang Gliding Association • View topic - Cape Kiwanda HG reunion anyone? Cape Kiwanda HG reunion anyone? Re: Cape Kiwanda HG reunion anyone? MY TRIP TO CAPE KIWANDA HAS BEEN CANCELLED. I want to let everyone who was planning to join me at Cape Kiwanda in early May (4th - 11th) that I will not be there then. My wife suffered a stroke this past Tuesday and is now in a physical rehab hospital. The prognosis is good for her eventual good recovery but with not knowing what it will be a month from now, I cannot plan for a trip that would take me 1200 miles from our home. I regret having to change plans for those who were looking forward to our meeting at "Mother Kiwanda" and I was of course looking forward to more altitude and flight time than I get at Dockweiler. Please do keep in mind that the 47th anniversary "Otto Lilienthal" meet will be held at Dockweiler on May 27th, all day, and I hope to see you there. Thanks for letting us know Frank. Best wishes to Judy for a full and speedy recovery. Yes Frank that would be great. I’m located in southern Oregon. No club controls Kiwanda we pay federal taxes to use it, so it’s public, therefore free for anyone to use. I would be excited to come with state of the art, and nostalgia gliders. Let me know if I can help although I’m on the other end of oregon. Unfortunately my wife's condition at home caused me to cancel my trip to Oregon this spring season but maybe next year we can make it happen.